Achieve tanned, hydrated skin with MineTan Moroccan Foam. The self-tan not only imbues skin with a gorgeously golden colour, but also contains numerous moisturising and nourishing properties to keep your complexion glowing. Key ingredient Argan Oil traps moisture and protects skin from environmental damage, reducing the appearance of fine lines, wrinkles and stretch marks. 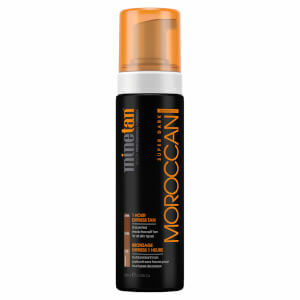 Developing within an hour, the tanning foam uses dark brown bronzers to give skin a golden sheen worthy of the beaches of Morocco. For an even, streak-free tan, apply to clean, exfoliated skin in a well-ventilated area. Allow at least a few minutes before contact to clothes. Use sparingly on elbows, hands, knees and feet. Wash hands immediately with soap and water after each use. CHOOSE HOW DARK YOU WANT TO GO. Rinse with LUKE WARM WATER ONLY for 60 seconds. Do not use soap or scrubs and do not rub or scrub freshly tanned skin. By showering 1 hour after application, you will achieve a light to medium result. By showering 2 hours after application, you will achieve a medium - dark result. For a deeper darker colour, you can leave for 3 hours and beyond. We recommend using MineTan’s Bronze On Mitt and using only 40ml per full body tan. You should achieve 4-6 tans per bottle. If you dare double coats we recommend using only 60ml. Water (Aqua), Propylene Glycol, Dihydroxyacetone, Glycerin, PEG-40 Hydrogenated Castor Oil, Argania Spinosa Kernel Oil, Sodium Lauroyl Sarcosinate, Cocamidopropyl Betaine, Caprylyl/Capryl Glucoside, Sodium Lauroamphoacetate, Cetyl Hydroxyethylcellulose, Ethylhexylglycerin, Phenoxyethanol, Sodium Metabisulfite, Citric Acid, May Contain +/- Caramel, Red 40 (CI 16035), Blue 1 (CI 42090), Yellow 5 (CI 19140).